A group of commandos tackle a zombie outbreak after a chemical spill. 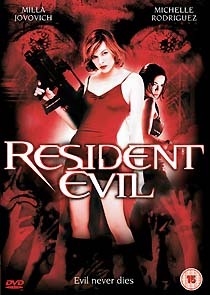 This film is based on the unsurprisingly popular Resident Evil series of computer games (primarily 1997's Resident Evil 2, if remarks on the DVD's commentary track are any indication), but Anderson's anaemic action movie merely echoes other, more imaginative, movies (Cube and George Romero's ...of the Dead zombie trilogy are cheerfully plundered here, something that's freely acknowledged on the commentary track). It's a shame, because Anderson is technically gifted, and instills a great deal of energy into otherwise leaden material. If you were being particularly generous, you might even credit him with a degree of style. Resident Evil was largely shot in Germany, with a lean budget of about $35m. Sadly, this is reflected in the film's mediocre CGI effects, and some frugal, uninspiring set design. Much of the film takes place in semi-darkness and shadow, causing significant graininess. This has been faithfully reproduced in the transfer to disc, but there are some shots which seem disproportionately coarse (and not only the flashback shots that were especially treated). On the whole, though, this is a very acceptable transfer, with good contrast, colour balance and detail. Edge-enhancement has been kept to a reasonable level, and the process has not resulted in unwanted artefacts. (For especially picky viewers, there's a bare bones Superbit version available in the US, which also boasts DTS audio). The film, spread over both layers of a DVD9, has an average bitrate of 5.82 Mb/sec. The disc's audio mix (in Dolby Digital 5.1, at 448kbps) is appropriately aggressive, (showcasing the score by Scream's Marco Beltrami and Marilyn Manson), but lacks the nuance that you might find on a better funded blockbuster. There's significant rear and bass channel content, too, giving a very satisfactory aural workout. The disc contains a number of bonus features, including an undisciplined commentary track, featuring Anderson, producer Jeremy Bolt and stars Jovovich and Rodriguez. Actor Jason Isaacs, who is something of a talisman for Anderson, having appeared in several of the director's movies (he provided Resident Evil's voice-over, without on-screen credit) is allegedly also present, but says very little. The track is a riot, with no-one taking things too seriously, and the two actresses constantly goading each other with bitchy insults. 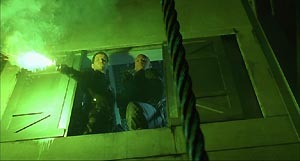 Annoyingly, Anderson refers several times during the track to a second commentary, with visual effects supervisor Richard Yuricich, that isn't on the disc (it's especially irritating, since Anderson often defers discussion about the film's effects because they'll be covered by Yuricich's commentary). The disc has a pretty decent Making of... featurette, running twenty-seven minutes. Most of the key cast and crew members are interviewed, and there's also a fair bit of behind-the-scenes material (including footage of the cast members training for the fight scenes). Featurettes on the Scoring (11m), Costumes (3m) and Set Design (4m) are also offered, along with a minute's worth of zombie test footage (as with some of the Making of... footage, this is more blatantly graphic than anything in the film). A full-length theatrical trailer and short teaser trailer are also available. Slipknot's My Plague (New Abuse Mix) music video is also available as an Easter Egg (it can be accessed from the main menu, by highlighting the Special Features icon, then pressing left. A new icon appears: selecting it leads to a screen where the user has to enter a five-digit code, which is "hidden" on the Set Up menu: 86314). Pathé's UK Region 2 DVD has arrived amid growing resentment about companies re-releasing sparsely-featured discs with additional material. Fans of Resident Evil have long suspected that the Region 1 disc (released in the US by Columbia Tristar in July 2002) wasn't going to be the definitive version, leading to much speculation that the eventual Region 2 release would be a significant improvement. As with the director's 1997 movie Event Horizon, there has been plenty of fan scuttlebutt about a longer, gorier version of the film. Anderson himself, perhaps unwisely, has revealed in interviews that he'd recorded a second commentary track (with Richard Yuricich) to balance the boistrous nature of the existing track, and that it was only pressure of deadlines had prevented the film being released as a loaded two-disc Special Edition. Well, eight months later, the UK version has been released, and almost nothing has changed. In fact the UK disc very closely resembles the American release (it's missing a couple of unrelated Columbia Tristar trailers, including Spider-Man, and the usual lightweight cast and crew biographies). It's also has the same content (give or take local language variations) as versions released in several other European territories. Pathé's UK disc provides just about as much background information as most viewers will be willing to absorb. Fans may like to know that a two-disc version has been released in Germany, which features DTS audio tracks in German and English. Contrary to some reports, the German disc does not have a different commentary track (featuring German-born producer Bernd Eichinger): it's the same track as the US and UK discs. The Making of... featurette on the German disc is dubbed, and no English language option is available. Some sources claim that the German disc has deleted scenes (including an alternative ending), but these do not appear on the disc. It does have an alternate ending (running less than a minure, with a three-minute introduction by Anderson). The Australian Region 4 version, from Constantin Film (distributed by Buena Vista), has the same extras as the UK Region 2 disc, but also has a 5.1 DTS track (at 768kbps). With thanks to James Reader, Whiggles and Shawn Boyer.